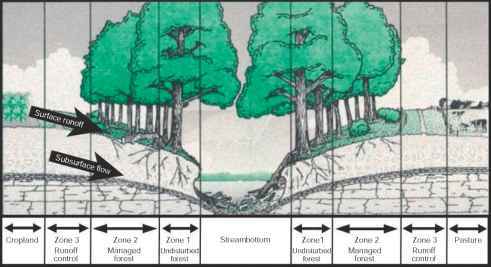 Many agroforestry systems lend themselves to the con cept of ecological engineering, whereby the ecological processes are used to solve engineering problems in such a way that ecosystems are designed, constructed, and managed for both environmental and societal bene fits. The premise that structurally and functionally more complex agroforestry systems have greater efficiency of resource capture and utilization than either crop or tree monocultures provides a strong foundation for such efforts. 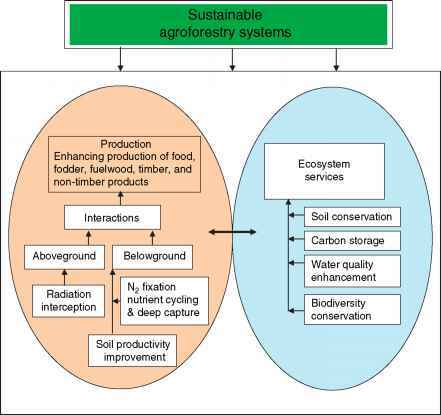 An important consideration in design of agrofor estry systems, however, is the interplay and importance of ecological, economic, and social attributes and objectives of agroforestry systems. As illustrated schematically in Figure 5, enhanced and sustained production of many typical 'services' normally associated with food or timber production systems is possible largely as a result of forced integration of trees, crops, and/or animals in such a way that interactions are created both above and below ground. The resultant 'production system' feeds back at a number of scales to extra and intrasystem components to provide a number of ecosystem services typical of those found in natural, undisturbed systems. For example, recent studies that tree incorporation in pastures leads to retention of more phosphorus in the system and thus prevention or reduction of the chances of its transport from the coarse textured soils of Florida to adjacent water bodies corroborate the premise of silvopasture system design. Another example is the intercropping of trees with agricultural crops in the temperate zone (Figure 1b), where trees are planted in widely spaced single or double rows in agricultural fields. Although the trees use up about 10% ofland, this 'loss' will be more than offset economically and ecologically by production and service value coming from the tree component. Figure 5 A schematic presentation of the major mechanisms and processes involved in production and service attributes of sustainable agroforestry systems. Ecological benefits of intercropping that have been mon itored in such a system in eastern Canada during a 20 year period include enhanced biodiversity (of birds, earth worms, and beneficial insects), soil organic matter buildup, synchronous development of tight nutrient cycles that prevent nutrients leaching into adjacent waterways, and higher sequestration of carbon both above and below ground. Most economic models demonstrate equality between agroforestry and monocropping systems, based on the sometimes extended length of period associated with obtaining a long term product from the tree compo nent. When short term, mostly nontimber products from the tree components are considered in conjunction with large scale societal benefits (e.g., improved water quality and reduced pesticide use), the economic models tip very much in favor of agroforestry systems.